Lots of confused talk about Medicaid and how accepting the federal ACA Medicaid expansion will somehow leave Utah broke down the line. Despite what you've heard, Medicaid costs aren't out of control, and in fact, have grown notably slower than those of private insurance. Note how spending, per beneficiary, has grown more slowly for Medicaid (the red line) than for any of the other major types of insurance. 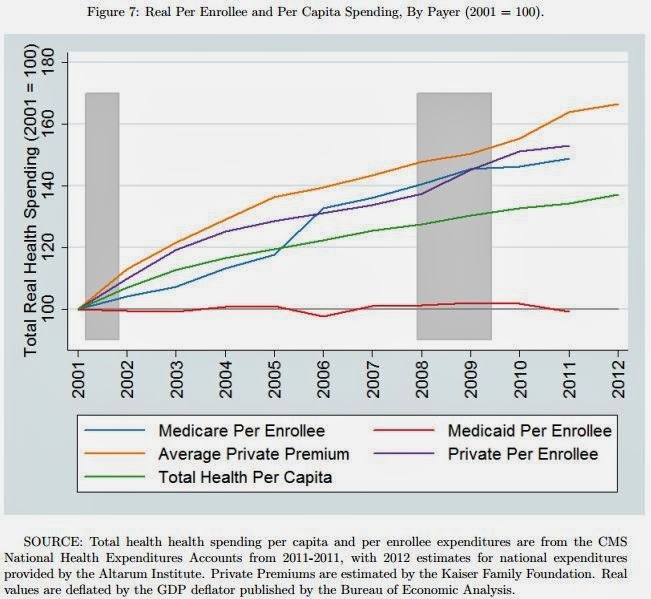 This study has more on how health care cost growth has grown more slowly for Medicaid than private insurance. Utah legislators would do well to keep this in mind when figuring out how to use the ACA Medicaid expansion money.